as a custom shop reissue! How about a pedal that goes from loud clean overdrive to '60s "Satisfaction" fuzztone all in the turn of a single knob? 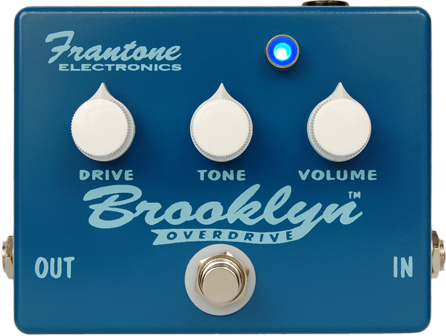 That is the revolutionary Frantone Brooklyn Overdrive! First released in August of 2003, the Frantone Brooklyn quickly became known as a game changing overdrive, not only for its strong output but for the fuzz bite you can dial in right on top of that. The extra broad tone contour gives you a wide range of desirable textures too, from clean loud fidelity, to mellow smooth grind, to cranked up amp punch with full rich bite cutting through the mix. Get the best natural tone by making your great tube amp sound even better with this incredibly loud overdrive - clean or fuzz - you choose! A completely original and unique design by Fran, delivering Frantone's signature sounds - with kick! Extremely quiet yet unbearably loud - The big blue sound is made even more pleasing by the vintage Brooklyn style design, cool retro knobs, and cobalt blue LED! ©1994-2017 Frantone Electronics All rights reserved.